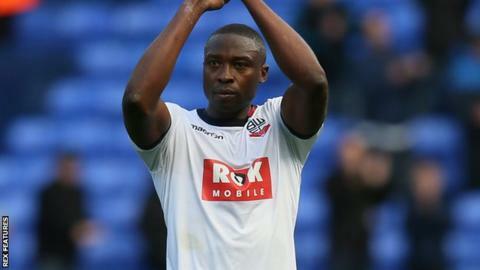 Bolton manager Neil Lennon says he was impressed by striker Shola Ameobi after his goalscoring debut for the club. The 34-year-old signed a short-term contract on Friday and came on as a 12th minute substitute against Leeds, scoring his first goal 20 minutes later as Bolton got a 1-1 draw. "I thought he was brilliant," Lennon told BBC Radio Manchester. "It raised eyebrows when we brought him in, but he's definitely a handful and his all-round play was very good." Ameobi played almost 400 games between 2000 and 2014 for Newcastle, scoring 79 goals, before leaving for Turkish side Gaziantep BB last summer. He joined Crystal Palace on a six-month deal in January and had a trial with Wolves last month. "I didn't think he would last the pace as well as he did," added Lennon after the draw, which was just bottom-of-the-table Bolton's second point in the last six games. "I spoke to him before the game and he said 'I'm ready to play', which surprised me as he'd not played much football."